Be the first to share your favorite memory, photo or story of Ann . This memorial page is dedicated for family, friends and future generations to celebrate the life of their loved one. 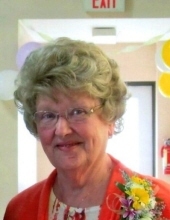 Ann Smedema, 85,of Beaver Dam and formerly of Cambria, passed away on Monday, November 12, 2018 at Hillside Manor. Ann (Dykema) Smedema was born on May 20, 1933 at home in rural Cambria, the fifth daughter of John and Anna (Dykema) Dykema. The child of devout farm parents, Ann was a student at East Friesland Christian School for eight years and was a 1951 graduate of Markesan High School. On October 30, 1951 Ann married the love of her life, Tunis (Toby) Smedema at Sheppard Air Force Base in Witchita Falls, Texas. Over the next four years, Toby’s service in the United States Air Force brought assignments in Texas, Alaska and Michigan. Service to the country completed, they returned to Wisconsin in 1955 to raise a family. During her long career, Ann was employed at local canneries as a human resource recruiter and coordinator and as an administrative assistant. Following her formal retirement in 2000, she worked another eleven years managing Cambria Park View Apartments. A faithful member of First Presbyterian Church, Ann served as a deacon and as a member of the Presbyterian Women Society. She volunteered at the Bread Basket Food Pantry from the time of its inception. Ann had a strong commitment to community service. Elected to terms on the local school board and the village board, she served both as village trustee and as Cambria’s first female Village President. When the Kiwanis Club began admitting women to membership, Ann was one of the first females invited to join and eventually she held the office of Vice President. Ever one to identify with the oppressed and marginalized, she was a devoted worker for Democratic candidates and for progressive causes. The time she and Toby spent in Alaska kindled a love of travel in Ann’s country girl heart that endured her entire lifetime. Over the years she visited Hawaii, Mexico, Guatemala, Costa Rica and Germany. The daughter of Dutch immigrants, she traveled to the Netherlands three times. In 2000, she returned to Alaska to help celebrate the 50th anniversary of the church she and Toby helped to build in Anchorage. Whatever she did and wherever she went, Ann enjoyed meeting people. Many of those she met, including the workers she recruited to work in the canneries, became lifelong friends. Ann is survived by her children: Jacqueline Syens, Tomah; George (Kathleen), Cambria; John (Linda), Beaver Dam; Toby (Stacy), Cambria, Ken (Dann Trainer), Minneapolis, MN. Her grandchildren: Ted Syens, Shauna (Johnny) Cardenas, Tim (Vanessa) Syens, Erin (Damon Glenn) Austin, Amber (Casey) Wegner, Erik (Tina) Smedema, Danielle (Casey) Whyte, Bo Daniel (Megan) Smedema and Kirsten Smedema; sixteen great-grandchildren and two great-great grandchildren. She is further survived by her sisters, Henrietta Vander Werff, Waupun and Janice (Roger) Van Beek, South Holland, IL; a brother-in-law, Jack Smedema; two sisters-in-law, Babe Koorndyk and Bernie Guess; nieces, nephew, cousins and friends. Ann was preceded in death by her husband Toby in 1987 and her son-in-law Tom Syens in 2007; by her parents John and Anna Dykema; her brother Henry Dykema; her sisters Elizabeth Van Zanen, Gertrude Freeman and Pearl Schroeder; six brothers-in-law, two sisters-in-law and her husband’s parents, George and Mary Smedema. Memorials may be made in Ann Smedema’s name to the First Presbyterian Church or the Bread Basket Food Pantry. The Kratz-Smedema Funeral Home in Cambria is serving the family. For more information please visit www.kratzfh.com. To send flowers or a remembrance gift to the family of Ann E. Smedema, please visit our Tribute Store. Funeral dinner to follow the committal at the church fellowship hall. "Email Address" would like to share the life celebration of Ann E. Smedema. Click on the "link" to go to share a favorite memory or leave a condolence message for the family.